Background: Progressive disability in activities of daily living (ADL) is inevitable for people with Alzheimer's disease and related dementias (ADRD). Attempts to slow or prevent ADL disability have been unsuccessful despite making progress in behavioral training methods. Missing from this research is an emphasis on how we maximize a patient's engagement during training and the rigorous examination of implementation protocols (dosing and training methods) which may advantage learning in people with ADRD. 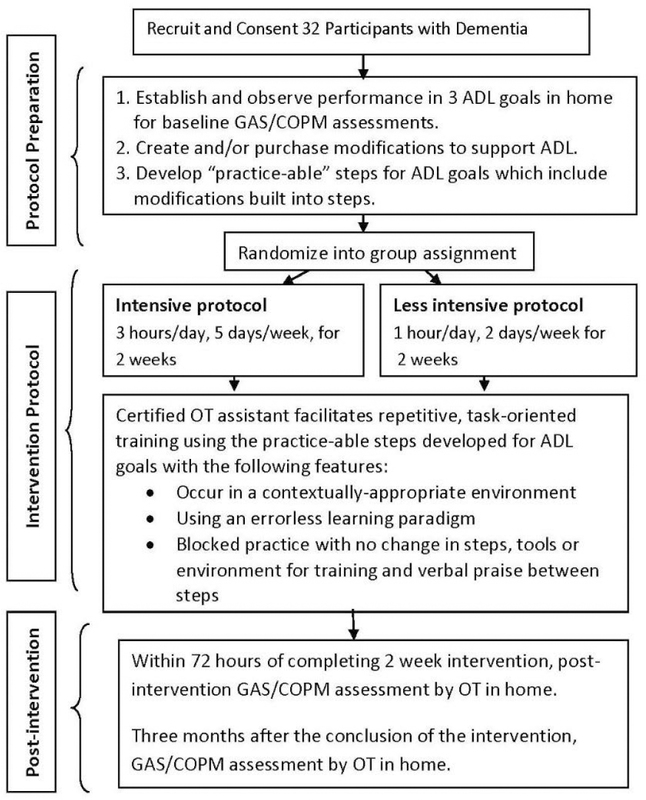 Our team addressed this gap with the development of the Skill-building through Task-Oriented Motor Practice (STOMP) intervention which creates methods for obtaining ADL goals that support "personhood" and tests high-intensity protocols that appear to advantage learning and sustained learning over time. Through this study, we aim to evaluate differential outcomes in activities of daily living by two different dose levels of the STOMP intervention. Secondarily, we will assess the moderating effects of participant attention to task during training. Methods/Design: A randomized, single blinded, controlled trial with 32 eligible patients with dementia assigned to either the original, intensive STOMP protocol (3 hours per day, 5 days per week for 2 weeks) or a less-intensive STOMP protocol (1 hour per day, 2 days per week for 2 weeks) delivered by an occupational therapy assistant in the home. ADL training is delivered using motor learning theory techniques of blocked practice, continuous verbal praise, errorless learning and intense dosing schedules. Blinded occupational therapists will complete baseline, post-intervention and 3-month follow-up assessments in the home. Primary outcomes will be examiner and caregiver rated ADL performance. Secondary outcomes will be the amount of time the participant is engaged in the task (e.g., attention to training). Discussion: Through this protocol, we will examine differential ADL outcomes by dose for the STOMP ADL intervention. Our results will inform dosing parameters for future intervention studies for people with ADRD. Ethics: This study protocol was approved by the University of Oklahoma Health Sciences Center Institutional Review Board (#4648) and will be performed in accordance with the Declaration of Helsinki. Informed consent: Written consent will be obtained by the participant's legally-authorized representative as older adults with dementia are considered a vulnerable population. However, in all cases, assent of the participant will also be obtained at the time of consent. CAC and JAS designed the trial protocol, collected data, wrote the paper, and approved the final version the paper. LH and CP participated in participant recruitment. CAC participated in trial conduction. All authors edited and approved the final version of the paper. Progressive disability in activities of daily living (ADL) is inevitable for the 5.4 million people with Alzheimer's disease and related dementias (ADRD) (Alzheimer's Association, 2015). Attempts to slow or prevent ADL disability have been unsuccessful despite making progress in behavioral training methods. Missing from this research is an emphasis on how we maximize a patient's engagement in training and the rigorous examination of implementation protocols (dosing and training methods) which may advantage learning in people with ADRD. Remarkably, people with ADRD maintain desire to retain "personhood" which is the essence of who one is and what one does to reflect his/her identity (Smebye and Kirkevold, 2013). Yet researchers have fallen short of developing ADL interventions that evaluate and integrate unique aspects of personhood into patient and family-directed ADL goals. Thus, opportunities for maximizing patient engagement in training are missed by not focusing on meaningful ADL. Also overlook on ADRD ADL research is the systematic examination of training protocols that may advantage sustained learning and, therefore, delay decline in ADL. Motor learning programs that emphasize repetitive practice of activities delivered through high-dose, intensive practice schedules (3-6 hours per day, 5 days per week, for 2 weeks) have repeatedly demonstrated permanent change in both brain structure (e.g., new connections to undamaged cerebral areas) and behavior (improved function), but is untested in dementia beyond our work (Taub et al., 1998; Lillie and Mateer, 2006; Ciro et al., 2013, 2014a, b). Our team believes that enduring structural and behavioral change is possible in people with ADRD, particularly when training taps into procedural ADL memory known to be preserved into late disease states (Cohen and Bacdayan, 1994). Given the undisputed impact of repetitive, intense practice on brain structure and functional behavior and the benefits of maximal patient engagement in training, we created Skill-building through Task-Oriented Motor Practice (STOMP) which uniquely structures evaluation (development of examiner and caregiver-rated ADL goals prioritized by retention of personhood), treatment planning (task-oriented training enhanced with cognitive strategies and assistive technology) and implementation (repetitive, errorless, motor learning of three ADLs delivered through an intensive practice schedule, 3 hours per day, 5 days per week for 2 weeks). In our previous work testing the STOMP protocol, we found that people with ADRD significantly improved in ADL and sustained improvement at 90 days (P < 0.05) (Ciro et al., 2014a, b). Despite our standardized dosing, variation in individual outcomes post-intervention have led us to question both the effect of intensive practice and more specifically, the role of sustained attention to task on learning in ADRD. Therefore, our next step is to compare our original, STOMP protocol with a less-intensive protocol (three ADL tasks practiced 1 hour per day, 2 days per week for 2 weeks) and to examine the moderating effect of sustained attention. This is a randomized-controlled trial over a 2-week intervention period and a 3-month post-intervention follow-up period that will occur over 24 months. We will employ block randomization where participants are randomized in blocks of randomly chosen sets of 2 or 4, ultimately resulting in eight participants randomized to each group in the 1 st year and a total of 16 participants assigned to each group by the end of 20 months. Two occupational therapists (OT), blinded to group assignment will complete baseline, post-intervention and 3-month follow-up assessments. The certified occupational therapy assistant (COTA) will be given the group assignment by the principal investigator after the baseline evaluation is complete. All screening, baseline and follow-up measures will be done in the participant's home with the caregiver present. This study protocol has been approved by both the primary funding source and the University of Oklahoma Health Sciences Center Institutional Review Board (IRB). Study modifications will be presented to the IRB and approval will be granted before changes are made. The principal investigator or trained designee will be accountable for the responsible dissemination of the study objectives, protocol, risks/benefits and findings to potential participants, the funding sources and the scientific community at large. Written consent will be obtained by the participant's legally-authorized representative as older adults with dementia are considered a vulnerable population. However, in all cases, assent of the participant will also be obtained at the time of consent. Able to participate in 3 hours of daily intervention in their home environment for 2 consecutive weeks (excluding weekend? Patients may withdraw from the study for any reason at any time. The principal investigator may determine whether it is unsafe for the participant to continue in the study. Data will be analyzed according to an intention-to-treat paradigm where data from all randomized participants are analyzed according to initial random assignment. Randomization will be computer-generated and assigned by the statistician. The principal investigator, and the evaluating occupational therapists, will be blind to randomization. The interventionist will open randomization assignment at the time of intervention scheduling. At the time of scheduling, the participant and caregiver will become aware of group assignment. The Canadian Occupational Performance Measure (COPM) includes a semi-structured interview that will assist the OT in facilitating family/participant chosen ADL, home management or leisure goals that support retention of personhood for the person with dementia. Goals chosen through the COPM are performed by the participant and assessed by the OT in order to develop measurable Goal Attainment Scaling (GAS) outcomes. Each goal must have an identifiable beginning and concluding step for creation of "practice-able" steps for task-oriented training. Practice-able steps will embed both task modifications and assistive technology determined by the OT to support performance and will be situated contextually within the participant's habits and environment. To enhance transfer of training to the caregivers, we will invite caregivers to watch the intervention daily and require hands-on training of the intervention 1 day per week. The intervention protocol incorporates important multi-component features of motor learning. Each group will practice the task as many times as possible during their allotted time in training. For the intensive protocol, each hour of training will focus on one of three identified goals and will include 50 minutes of intervention and a 10-minute break. The less-intensive protocol is based on home health treatment protocols where patients are seen 1 hour per day, 1-2 days per week. In the less-intensive protocol, each of the three ADL goals will be practiced as many times as possible within 20 minutes of the scheduled hour. In both protocols, the COTA will employ errorless learning where the participant is prevented from making errors through scaffolded trainer guidance progressing from hand-over-hand training, provision of tactile and verbal cues and, if possible, no cues for errorless performance. Continuous verbal feedback will be provided to the participant initially and minimized as training progresses. Post-intervention, caregiver support for questions and problems interfering with continued practice is provided monthly until the 3-month follow-up ([Figure 1]). Participants and caregivers will be recruited primarily through neurologists at collaborating public institutions including the Oklahoma City Veterans Administration Hospital. Community referrals will also be solicited by newspaper, television and radio ads and discussions held at Alzheimer's Association support groups. Outcome measures will be assessed at baseline, post-intervention and 90 days post-intervention ([Table 1]). Data capture, quality assurance, management, and processing will be consolidated through the use of the well-established Research Electronic Data Capture (REDCap) system (Harris et al., 2009). REDCap is a secure, web-based application designed to support data capture for research studies, providing: (1) an intuitive interface for validated data entry; (2) audit trails for tracking data manipulation and export procedures; (3) automated export procedures for seamless data downloads to common statistical packages; and (4) procedures for importing data from external sources. Online data capture forms will be created using REDCap, exported as pdf files, and printed for off-line use so that a hard copy will be available for data checks. REDCap will allow for multi-personnel access of project files and will be used by the PI, evaluators and trainer to capture data. Using calculations from our previous work (Ciro et al., 2013, 2014b), we determined a total sample size of 32 (16 per group) is required to detect a difference in 3-month mean GAS T-score values between the STOMP intervention group (mean [M] = 52) and the comparison group (M = 37), with 80% power assuming a standard deviation of 14 and a 2-sided 0.05 alpha level. This sample size will result in greater than 95% power to detect a difference in the 3-month mean COPM performance scores for the intervention (M = 7.4) and control groups (M = 3.4), assuming a standard deviation of 1.8 and a 2-sided 0.05 alpha level. The study statistician will analyze all data using SAS 9.4 statistical software (SAS Institute Inc., Cary, NC, USA). A two-sided 0.05 alpha level will be used to define statistical significance. An intenion-to-treat paradigm will be followed in which data from all randomized patients are analyzed according to intervention assignment without regard to adherence or outcomes. In Aim 1, we want to examine advantages to learning and retention of learning provided through receipt of an intensive STOMP protocol versus a less-intensive protocol. Therefore, changes in pre- and post-intervention (immediate and 90 day) GAS T-scores/COPM mean scores will be compared between intervention groups using a repeated measures analysis of variance (ANOVA) where time by intervention interaction term will be tested to determine if the estimated effect of the intervention program differs over the follow-up period. Analyses will be stratified by post-intervention time point if a significant interaction is found. Residual diagnostics will be created to assess adequacy of modeling assumptions. Non-parametric analyses will be used, focusing on 3-month differences, if ANOVA modeling assumptions are not satisfied. In Aim 2, we want to examine sustained attention to task as a contributor to differential outcomes. Therefore, using data from the Sustained Attention to Task behavioral form, we will tally the amount of time spent on each of three ADL goals over the 2-week intervention. Total minutes on task will be categorized by tertiles and plotted against change in GAS and COPM scores, both post-intervention and the 3-month follow-up. We are employing a variety of methods to ensure trial quality and control. First, we are carefully screening for dementia as the target sample. Other inclusion criteria include screening for alcohol abuse or significant neuropsychiatric disorders which may affect both the outcome of the trial and the safety of the participants. Second, we are obtaining assent for the participants to assure voluntary trial enrollment despite having a legal representative providing informed consent. Third, we implement rigorous training for both the evaluators and interventionist with daily intervention fidelity checks. Fourth, our data management plan ensures quality. We are entering data into the REDCap data system utilizing a second check to validate initial entries. A statistician involved in study design will manage all data analysis. All people with ADRD suffer from changes in performance in meaningful activities (Ciro, 2014; Alzheimer's Association, 2015). While significant progress has been made in fall prevention, environmental modification and caregiver training, little research has focused on the goals of people with dementia which may extend their functional abilities and maintenance of personhood and subsequently, improve the quality of their lives (Gitlin et al., 2001, 2005; Shaw, 2007). We address this gap by examining training paradigms that may advantage learning and retention of learning in dementia within the context of goals that hold personal value and meaning. The STOMP intervention may hold value for all disciplines that utilize patient training in service provision. We are actively recruiting at the time of submission. Our previous work has examined the feasibility and efficacy of the STOMP intervention in three previous studies. In a case study, we observed the process and outcomes of using the STOMP intervention (3 hours per day, 5 days per week, for 2 weeks) in the home of a woman with Lewy-body dementia and noted clinically significant improvement after a 2-week trial (Ciro et al., 2013). In our first quasi-experimental trial, we examined the feasibility of delivering STOMP in a clinic setting with the same dosage (n = 6). We noted significant improvement in ADL post-intervention which held for a 90-day follow-up (Ciro et al., 2014b). In our second quasi-experimental study, we sought to examine the advantages conferred by delivering STOMP in a home environment to people with mild-moderate dementia in two states, USA (Oklahoma and New Mexico) by comparing home results to our clinic results. Results indicate that post-intervention, the home group (n = 10) significantly improved in ADL and the gains were retained at the 90-day follow-up (Ciro et al., 2014a). Analysis of the home and clinic results revealed that the groups were not significantly different in sociodemographic variables, level of dementia or STOMP outcomes which may indicate promise for STOMP delivery in both home and clinical settings. Alzheimer′s Association (2015) 2015 Alzheimer′s disease facts and figures. Alzheimers Dement 11:332-384. Ciro C, Hershey L, Garrison D (2013) Enhanced task-oriented training in a person with dementia with Lewy-bodies. Am J Occup Ther 60:556-563. Ciro C, Poole J, Skipper B, Hershey L (2014a) Comparing differences in ADL outcomes for the STOMP intervention for dementia in the natural home environment versus a clinic environment. Austin Alzheimers Parkinsons Dis 1:1-7. Ciro C, Dao H, Anderson M, Robinson C, Hamilton T, Hershey L (2014b) Improving daily life skills in people with dementia: Testing the STOMP intervention model. J Alzheimers Dis Parkinson 4:165. Ciro CA (2014) Maximizing ADL performance to facilitate aging in place for people with dementia. Nurs Clin North Am 49:157-169. Cohen MD, Bacdayan P (1994) Organizational routines are stored as procedural memory: evidence from a laboratory study. Organization Sci 5:554-568. Gitlin LN, Corcoran M, Winter L, Boyce A, Hauck WW (2001) A randomized, controlled trial of a home environmental intervention effect on efficacy and upset in caregivers and on daily function of persons with dementia. Gerontologist 41:4-14. Gitlin LN, Roth DL, Burgio LD, Loewenstein DA, Winter L, Nichols L, Arguelles S, Corcoran M, Burns R, Martindale J (2005) Caregiver appraisals of functional dependence in individuals with dementia and associated caregiver upset: psychometric properties of a new scale and response patterns by caregiver and care recipient characteristics. J Aging Health 17:148-171. Harris PA, Taylor R, Thielke R, Payne J, Gonzalez N, Conde JG (2009) Research electronic data capture (REDCap)-A metadata-driven methodology and workflow process for providing translational research informatics support. J Biomed Inform 42:377-381. Hartman D, Borrie MJ, Davison E, Stolee P (1997) Use of goal attainment scaling in a dementia special care unit. Am J Alzheimers Dis Other Dement 12:111-116. Law M, Baptiste S, McColl M, Opzoomer A, Polatajko H, Pollock N (1990) The Canadian occupational performance measure: an outcome measure for occupational therapy. Can J Occup Ther 57:82-87. Lillie R, Mateer CA (2006) Constraint-based therapies as a proposed model for cognitive rehabilitation. J Head Trauma Rehabil 21:119-130. Shaw FE (2007) Prevention of falls in older people with dementia. J Neural Transm (Vienna) 114:1259-1264. Smebye KL, Kirkevold M (2013) The influence of relationships on personhood in dementia care: a qualitative, hermeneutic study. BMC Nurs 12:1-13. Taub E, Crago JE, Uswatte G (1998) Constraint-induced movement therapy: A new approach to treatment in physical rehabilitation. Rehabil Psychol 43:152-170.